Volunteering is a selfless act that allows people from different walks of life to work together for a common cause. 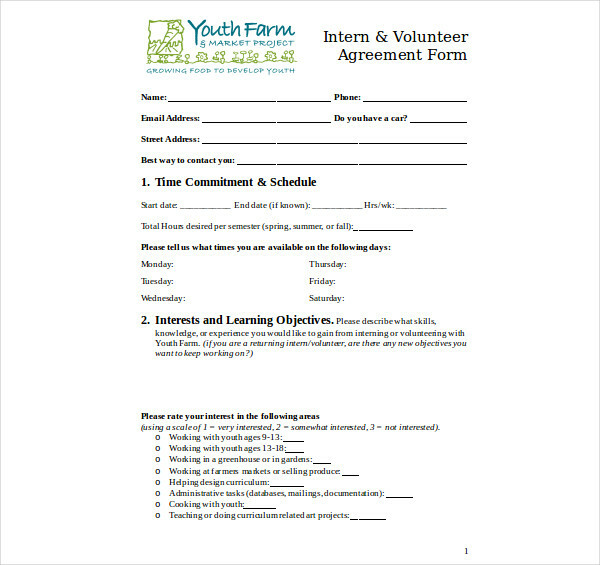 Even if this activity is beneficial to the personal growth of an individual and to the completion of the tasks of an organization, it is still important for a printable agreement to be developed prior to the volunteering program to ensure that there is an in-depth understanding between the volunteer and the organization that he or she will be working with. You may incorporate a confidentiality agreement within the volunteer agreement depending on the scope and nature of the transaction. Make sure to browse through the selection of downloadable examples available in this post so you can have references when making your own volunteer agreement. 1. 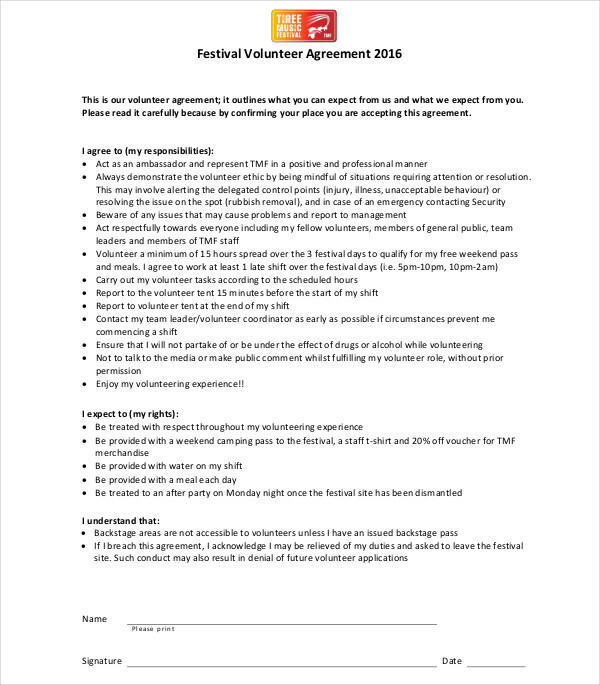 A volunteer agreement is a simple agreement that presents the minimum responsibilities of the volunteer once he or she agrees to be involved in a volunteer program or activity. This document can ensure that there is clarity with what is expected from the volunteer especially when delivering his or her expertise and skills for the benefit of the program of the organization. 3. 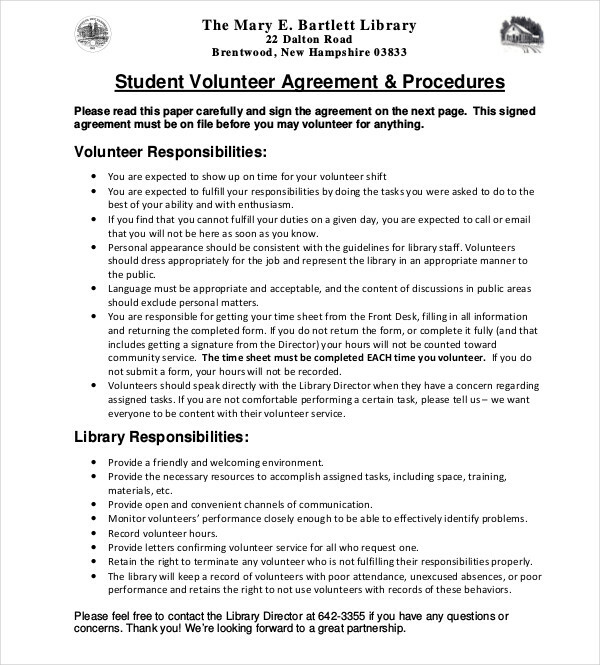 A volunteer agreement presents the nature of the volunteer program as well as the volunteering works that will be given to the volunteer. Having this document can allow both parties to have references whenever there are items that they would like to further understand or clear. Be aware of the purpose of the volunteer program. You have to know the main reason or objective on why you would like to come up with a volunteer program so you can use this as the core of the volunteer agreement specifications. Incorporate the volunteer program in your corporate social responsibilities. As a business, you have to ensure that your volunteer agreement and the actual volunteer program are aligned with your vision, values, and brand. Draft the activities that you would like to execute. A volunteer program should present the entirety of the volunteer program from the schedule that is needed to be followed by the volunteers up to the demands and needs of every processes and volunteering procedures. Present all the volunteering activities and all the details that you have initially drafted. Make sure that you will be specific and direct to the point when presenting the information of the volunteer agreement so that there will be no misunderstandings in the future. It will also be great if you can finalize the timeline that your business and the volunteers can look into. A volunteer agreement can help you limit the association of volunteers to your organization. 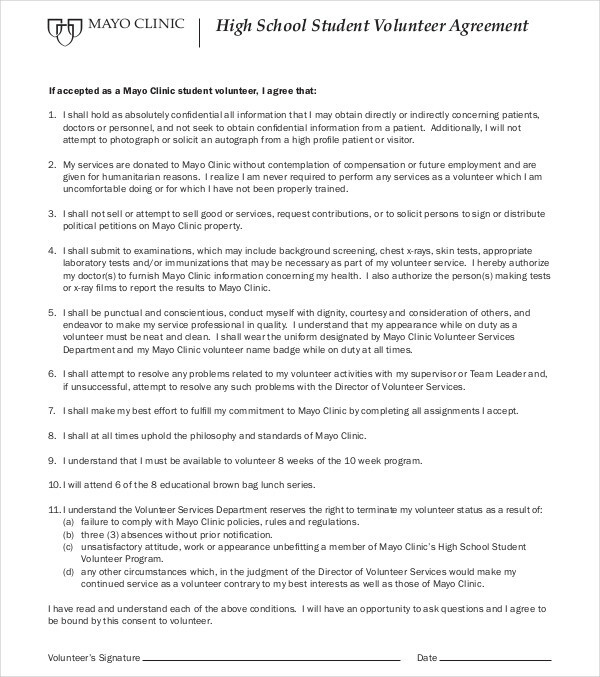 A volunteer agreement can list down all the entitlements of your organization as well as the volunteers. A volunteer agreement can clear all issues, concerns, and questions about the volunteering program. 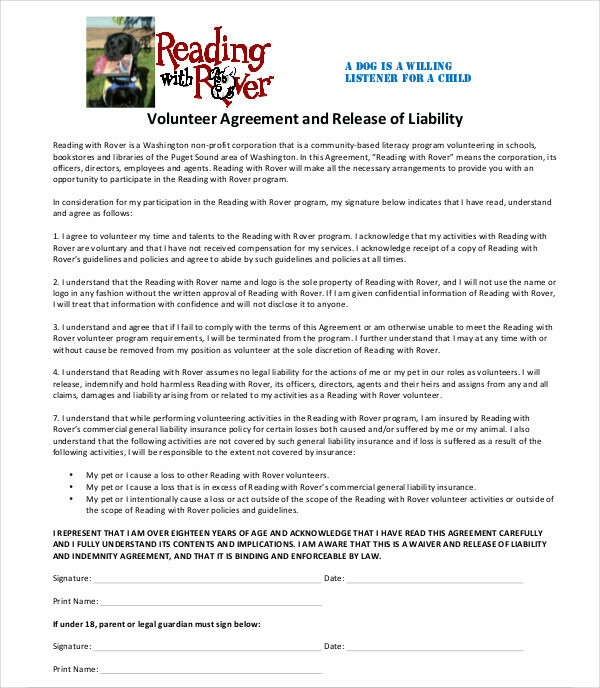 A volunteer agreement can make the transaction more formal. 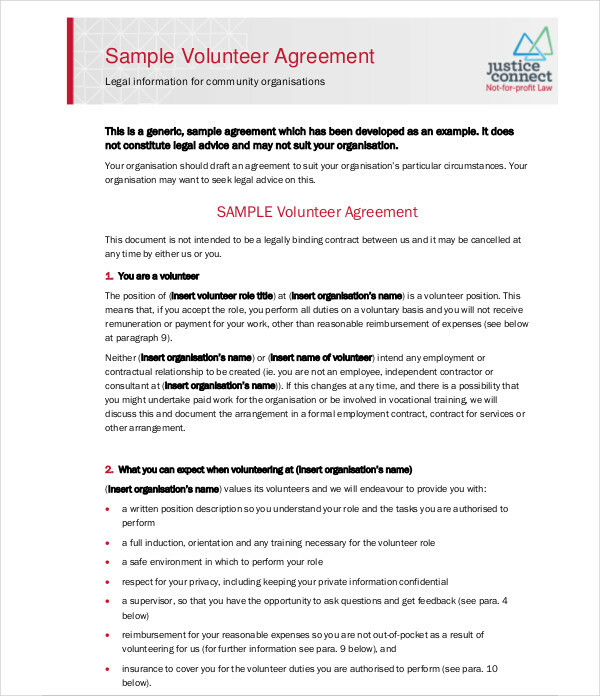 A volunteer agreement can help volunteers understand the extent of their work processes. The list of agreement examples in this post can help you a lot not only when it comes to formatting your volunteer agreement but also when identifying the information that you need to present to the entities to whom the volunteer agreement will be given. 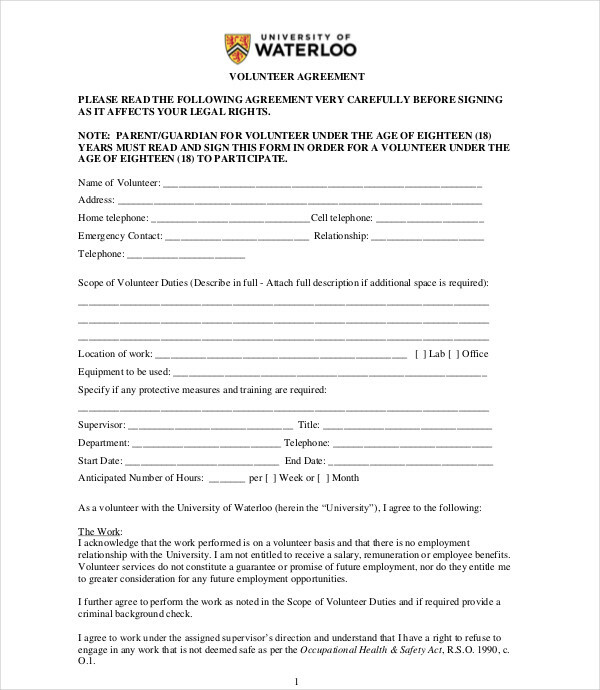 Maximize the usage of references so you can create a detailed and well-formulated volunteer agreement.